The Joplin tornado was powerful enough to scour pavement from parking lots and rip 300lb steel-anchored parking stops from the ground. 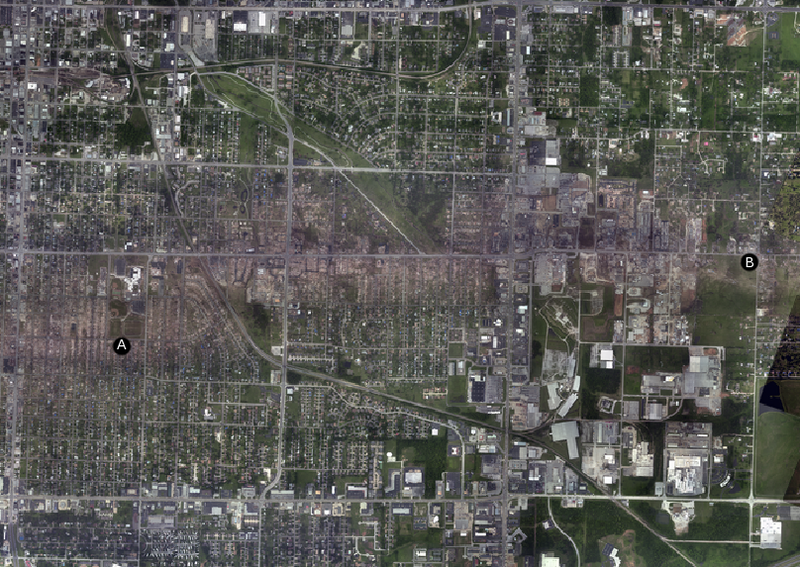 Without a doubt, the Joplin tornado caused the most intense tornado damage ever surveyed in a heavily urbanized area. 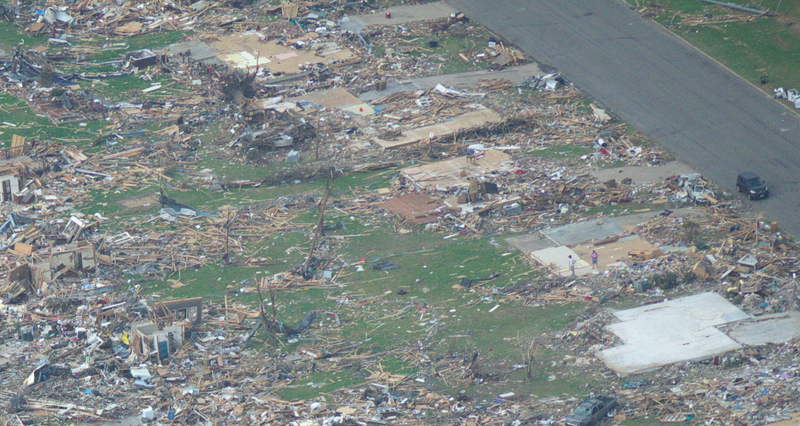 In this image, empty foundations are flanked by debarked trees and lawns that have been partially scoured of grass. □ The power of the EF5 Joplin tornado is sometimes muted against the fury of the 2011 season. While not as photogenic as the Tuscaloosa tornado three weeks before, the Joplin storm left some of the most extreme tornado damage ever documented. Engineers concluded that the winds had to be in excess of 205 mph to tear out the parking stops by St. Johns Hospital (Joplin Globe, 2011). Winds of that intensity only a few inches above the ground easily indicate winds over 250mph several feet above the ground. The fact that the Joplin tornado spent the duration of its EF5 intensity atop a grid of homes and businesses gave meteorologists a fascinating look at the structure of an EF5 tornado. Never before had such a violent tornado destroyed so many homes. 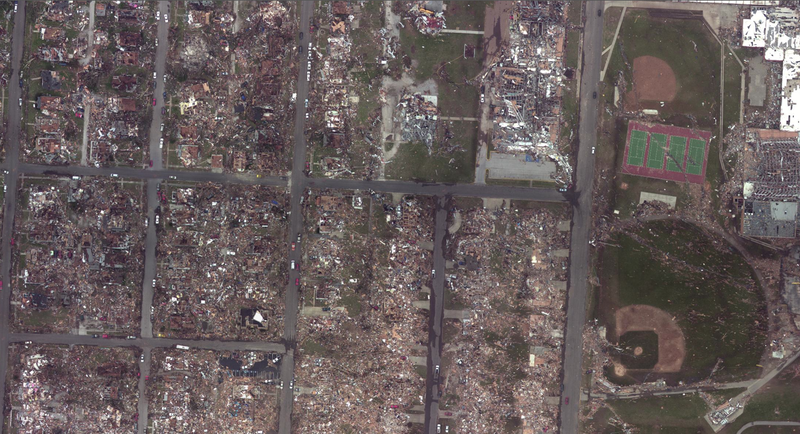 In fact, the Joplin tornado killed more people and destroyed equally as many buildings as all other EF5 tornadoes since the year 2000 combined. 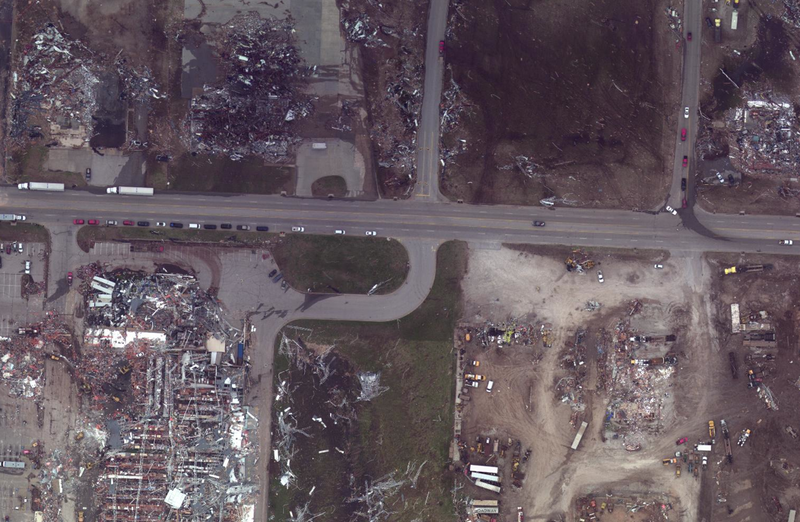 The Joplin tornado maintained EF5 intensity from an area just north of St. Johns Hospital all the way to Rangeline Road. 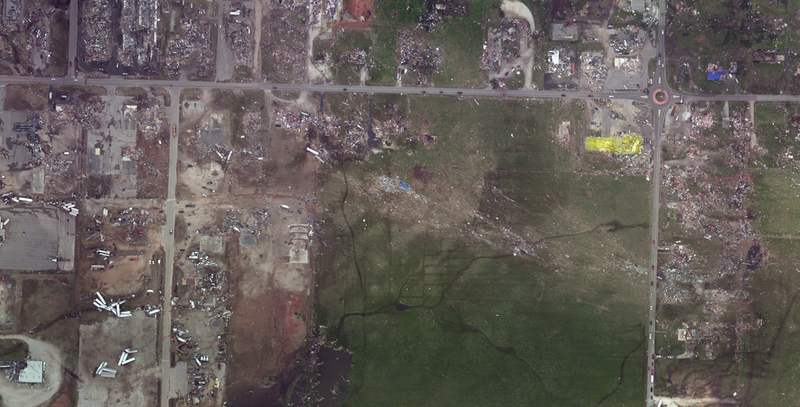 Aerial imagery indicates the tornado reached peak intensity in neighborhoods west of Joplin High School. Dozens of likely well-built homes were swept away between Pennsylvania and Iowa Avenue. The damage was remarkable considering the urban density of the area. The tornado maintained EF5 intensity all the way to east Joplin. On Rangeline Road, there were 18 fatalities in six businesses, eight of which occurred at a Home Depot (lower left). The tornado was powerful enough to scour grass from the ground, visible here in the worst streak of damage just north of Home Depot. The tornado was wrapped in rain and not clearly visible to those in its path, and the mesocyclone that spawned it was so immense it blackened the afternoon sky. Despite the less than perfect filming conditions, more than a dozen movies were taken in the vicinity of the tornado. The storm’s massive circulation brought hurricane force wind gusts over a wide swath of Joplin, so most of the films were recorded in the storm’s outer fringes. Only a few videos were taken inside the EF2 damage contour. The most well-known video of the Joplin tornado was taken at a Fastrip gas station. Filmed at the intersection of 20th and Duquesne Road, the tornado was 3/4 of a mile wide and at EF4 intensity when it passed over the area. When listening to the video’s audio, it is clear the distribution of winds within the tornado was very uneven. Almost all of the damage occurred during a brief period on the backside of the storm. This may have been the result of a suction vortex imbedded within the tornado or, as some people have suggested, it may have been the back “eyewall” of the tornado after the calm center had passed. It takes a good set of headphones to really appreciate the roar of the approaching winds, which were likely well over 200mph just above ground level. The wind feature, be it a suction vortex or the tornado’s eyewall, was deafeningly loud, yet only audible for a few seconds before impacting the Fastrip. Therefore, it was moving significantly faster than the forward motion of the tornado, which was about 20 to 25mph. This gives credence to the theory that it was a powerful suction vortex rotating within the tornado. Using Logic Pro, I was able to sort out much of the interfering noise and focus specifically on the base sounds which constitute the “roar” of the tornado. Each point on the graph is the average base volume around each point (e.g.. the graph’s highest reading at 3″:05″ is the average of :04 – :06 and the point “:10” is the average of :09 – :11). The data indicates the winds dropped significantly inside the tornado right before the spike of highest winds. The roar of nearby winds was audible in the calm center and caused some interference, so the drop was likely even more pronounced than shown here. The Fastrip was near the geographic center of the damage path and likely experienced the tornado’s eye. It is plausible that the winds decreased significantly, if not completely, right before the most violent winds struck. In the video, a friend of the man filming can he heard saying “We’re good, we’re good” as the audible winds dramatically decrease in the center of the tornado. Also, it appears that the extremely high winds lasted only a few seconds. Even though the overall volume increases when the roof is torn off (as the camera is directly exposed to the outside) around 3:05, the base volume, which may be indicative of the most violent winds, dramatically decreases by 3:10. 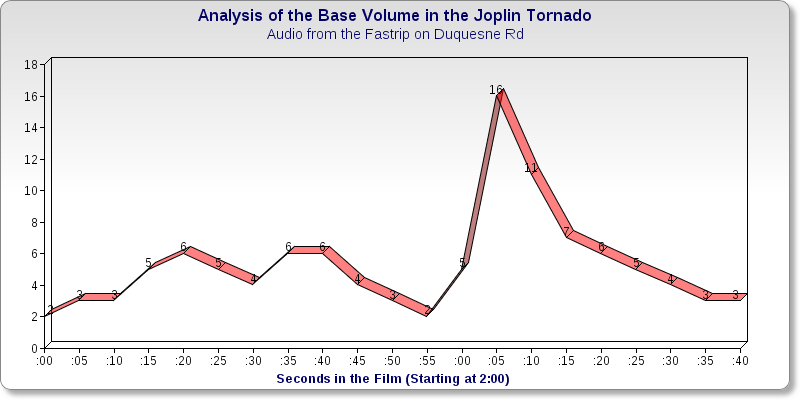 If the speed and size of the Joplin tornado were the only variables considered, it would be assumed that the Fastrip experienced peak winds for nearly two minutes. But video evidence clearly indicates otherwise. This may provide an interesting perspective on other large or slow-moving tornadoes, such as the F5 tornado that struck Jarrell, Texas on May 27, 1997. The destroyed Fastrip is highlighted in yellow. A swath of partial vegetation scouring and wind rowing to the south of the store indicates the storm’s strongest winds may have just missed the area. The people who hid in the Fastrip were incredibly lucky. A similar series of events took place at a Pizza Hut on Rangeline Road with tragic results. Approximately 15 people sought shelter in a walk-in freezer, much like at the Fastrip. The tornado was still at EF5 intensity when it crossed Range Line Road, however, and the winds ripped into the freezer and killed a third of the people inside. From survivor accounts, it appears the Pizza Hut was also struck by a brief but powerful wind feature. The store’s manager, Christopher Lucas, tied a cord around his waist in an effort to keep the freezer door closed. One survivor, who held onto Lucas’s leg, later told reporters that “everything blew away. He was gone, the door was gone, everything.” Other survivors reported watching people who were “ripped out the front and back” of the freezer. Lucas was found dead in the parking lot of a nearby business. Four other people pulled from the freezer were also killed. Some of the survivors experienced severe blunt force trauma from high velocity debris. The Pizza Hut just happened to be directly in the streak of worst damage, which was made visible by ground scouring in an area between Home Depot and Walmart. A similar, primarily-audio film was taken with a cellphone near the Joplin High School on Minnesota Avenue. The tornado was at maximum strength as it passed by this area, and numerous instances of possible EF5 damage occurred only a few blocks to the north. 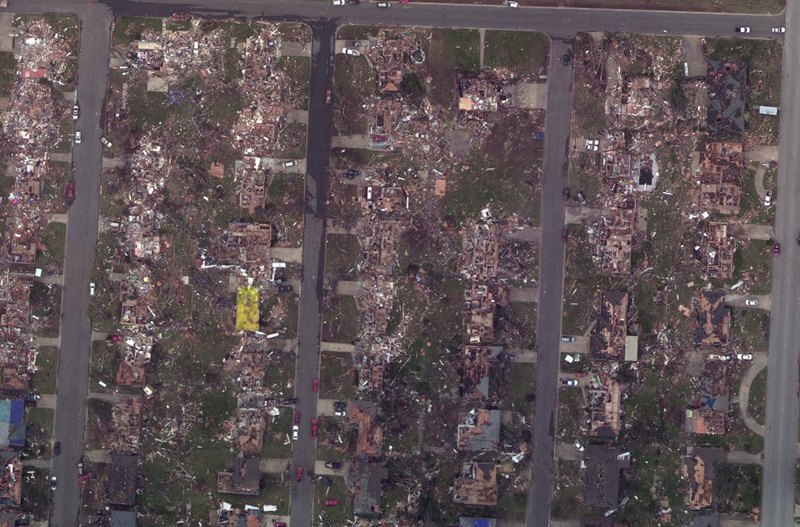 The home where the footage was shot was just outside the core of extreme destruction near the F2/F3 damage contour. An audio analysis of this video was difficult due to the interference of other sounds, particularly the clatter of debris striking the home. Even without an analysis of the base volumes, the video still provides useful information about the composition of the tornado. Damaging winds (75mph+) appear to affect the home for approximately 100 seconds, beginning at 1:30 and ending abruptly around 3:10. Most of the damage, however, occurs during two distinct bursts, each lasting less than 10 seconds. During the first burst (at 2:12), flying debris can be heard impacting the home and several loud thuds indicate the home’s roof had begun to fail. Loud clinking sounds are audible as the entire home shakes as if struck by an earthquake. Around 2:35 a second, stronger rush of winds strike the home, likely causing most of the structural damage. Near the end of the storm, the window in the bathroom shatters, an indication winds had shifted as the tornado’s center moved to the east. A third pocket of intense winds roars above the home for a few moments before the storm subsides. The home where the Minnesota Avenue film was taken was right at the EF2/EF3 damage contour, near the edge of the tornado’s path. Most, if not all of the approximately 70 fatalities that occurred in frame homes were in the EF4 and EF5 damage zones. The Minnesota Avenue videographer was just outside the area where the tornado’s most extreme wind features were causing EF4 and EF5 damage. The evenly spaced periods of wind acceleration may have been related to the home’s proximity to intense multiple vortices that passed only a few hundred feet to the north. The exact make-up of the tornado may never be known, but the videographer in the Fastrip on Duquesne Road encountered a brief, violent wind feature that the filmmakers on Minnesota Avenue did not experience. The film taken on Minnesota Avenue was just south of Joplin High School’s athletic fields (one block out of frame). The tornado’s most intense damage occurred only a few hundred feet to the north. Dozens of homes to the west of the high school were swept completely away. Both videos provide evidence that supports the notion that many violent tornadoes have small, extremely powerful wind features that cause the most intense damage. The Joplin videos indicate that the tornado had a wide swath of powerful winds capable of causing EF1 to EF3 damage, and small-scale vortices that caused EF4 and EF5 damage. While the exact winds will never be known, they were likely significantly more powerful than 210mph cap the Enhanced Fujita Scale appears to utilize.